Obatzda is a rich and flavorful Bavarian beer cheese dip made with soft cheese and omnipresent on menus of Biergärten (beer gardens) in Germany. It is also a classic Oktoberfest fare. 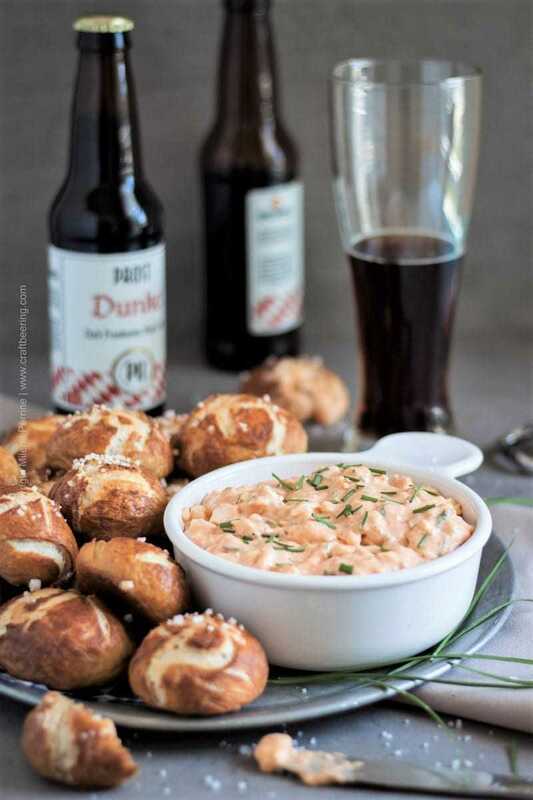 Prepare it following the step-by-step instructions below and enjoy it with a soft Bavarian pretzel and a cold German beer. The actual Bavarian word for this cheese dip is ‘Obatzter‘. You can also encounter it spelled as Obazda and in the Franconian region of Bavaria it is known by the name Gerupfter or Gerupfter Käse. Translated from Bavarian dialect the word Obatzter means something that was mixed or pressed. That something is cheese. Obatzda is made with soft, ripe cheese – most commonly Camembert, spreadable cheese, butter, beer, spices and onions. It has complex, well balanced flavors and even though it is quite rich (a bowlful can go a long way) it actually feels light. Once you try it you will embrace it whole heartedly – it is very, very tasty. Authentic Obatzda has a light salmon color (some say light brick) derived from the sweet paprika traditionally added to the dip. Not only is it a staple beer garden food all over Bavaria – it is the official Oktoberfest cheese dip. Obatzda is often served as a snack between meals, known as Brotzeit. If you go to Bavaria you are guaranteed to find the cheese spread on beer garden menus everywhere as well as among the offerings of cafes and restaurants with outdoor terraces. It is also commonly sold in supermarkets, just like Wurstsalat. As with many cheese based dishes Obatzda was invented out of economic necessity and gained popularity on the merit of its ease of preparation and appealing flavor profile. It first became popular in the early 1900s. In order not to waste (as in discard) older soft, ripe cheese past its prime the Bavarians began to press it (mix it) with spices, butter, a splash of beer and onions to create what evolved as the now well known specialty (no longer made with old cheese of course). The caraway seeds added to the dip are a traditional German spice known for their ability to aid digestion, but they also add a depth of flavor, especially in combination with the paprika. Start by cutting the Camembert in small pieces as shown below, add the sliced room temperature butter and the spreadable cheese wedges, then the paprika, caraway and salt & pepper. Add the beer and mix. Helpful tips, beer choices and serving ideas under the recipe card. Be sure to read them as they will address a variety of questions you might have as you shop for the ingredients and prepare the dip. Obatzda is the signature beer cheese dip of Bavaria (also known as Gerupfter in the Franconia region) and a classic Oktoberfest feast item. Bring the Camembert (cut in small pieces), spreadable cheese and butter (cut in small pieces) to room temperature. In a mixing bowl add the Camembert, spreadable cheese, butter, paprika, caraway seeds, salt and pepper and beer and press using a fork until well mixed together. Start by adding only 2 tbsp of the beer and keep adding until you reach the desired consistency (should be spread like but not runny). Cover with a lid or plastic wrap and refrigerate for 3 hours to firm up. Just before you are ready to serve take the dip out of the refrigerator and finely dice the onion. Run the diced onion under water (use a strainer) and dry off with paper towel before using. Finely chop the chives. Add the diced onion and chopped chives to the dip and fold until they are well incorporated. Garnish with chives. Serve with pretzels or thinly sliced onions and radishes or sliced rye bread. Note that Obatzda can vary in taste and also in consistency. There isn’t a single best way to prepare it. I’ve rounded up these tips to address any reservations or questions you may have. Do not fear the rind of the Camembert. Sometimes it can be removed, but there is no rule that says it should be. Besides Camembert you can use other soft, ripe cheeses such as Romadur, Bavarian Weichkäse or Brie. Even Limburger cheese will work nicely. Just be sure that the type you select is not too young as it will not lend itself to pressing. In addition to soft cheese a spreadable cheese is typically added to Obatzda. In Germany it is known as Schmelzkäse which is really processed cheese spread/spreadable cheese. It is used because of the added emulsifiers which help the dip come together better. Mascarpone and cream cheese could work if you don’t have spreadable cheese, even creme fresh/sour cream could work but the flavors will be off a little bit, they are not the traditional dairy product to use. Be sure to use room temperature cheeses and butter, do not microwave them to warm them up, just let them sit on the counter until they soften. Even the beer should be at room temperature. If this really upsets you, just separate about 1/4 cup of beer and drink the rest before you get down to mixing the Obatzda. Start by adding 2 tbsp of beer, then a bit more until you reach a consistency that is soft, but not even close to a thick sauce. You should not have to add more than 1/4 cup of beer considering the amounts of the other ingredients in our recipe. If you can comfortably scoop the mixture with a pretzel, it is OK. When you first mix the dip you will taste the beer more than after the flavors have married together in the refrigerator. Do not obsess over the exact amounts and proportions of cheeses and butter. I have seen Obatzda made with 1:1:1 Camembert, butter and spreadable cheese and other recipes with less butter, not as rich such as 5:3:1. I like our recipe as provided best, but feel free to make alterations in the proportions to suit your own taste. The paprika should be sweet paprika (traditional is Hungarian) or spicy if you want a bit of heat, try cayenne powder or something similar. Spanish paprika which is typically smoked is not traditional, but if you must, use it. It will simply add a layer of flavor not typical for Obatzda. Use paprika per your liking, but at least 1 tsp (our recipe calls for 2 1/2 tsp). You can soak the onions in water if you want to take some of the flavor edge off. Onions have a very high water content and will add a degree of extra liquid once folded into the obatzda. In order to not liquefy the spread too much you can gently squeeze out the water by placing the diced onions into a cheese cloth or clean cotton kitchen towel and twist to release excess liquids. The reason you fold the onions into the dip after you have refrigerated it to firm it up is that they will taste best. Ideally, Obatzda should be eaten fresh on the day it is prepared. It can however be refrigerated for a couple of days (you will notice how the onions impact the original flavor). The choice of beer for Obatzda is important as the beer directly imparts flavor to the dip. Typically a German wheat beer or a dark German lager are added as they are on the sweet side. I personally do not like using a Weissbier (please do not let my reservations influence you too much) because of the pronounced banana esters, even though the clove is very complementary. I prefer a Dunkel lager, but the drier, breadier and nuttier Franconian variety. The Munich variety is often too chocolaty and doesn’t work for me. So I chose our most favorite Dunkel brewed in the US (the same one we used to make Beer Falafel from scratch), brewed in the Franconian style by Prost Brewing Co. in Denver, Co.
A Schwarzbier will be perfect as well. The singular most popular item Obatzda is served with is the pretzel. Soft Bavarian pretzels (I baked the ones in the pictures and video using this exact recipe but shaping them differently) or hard pretzels are equally popular. 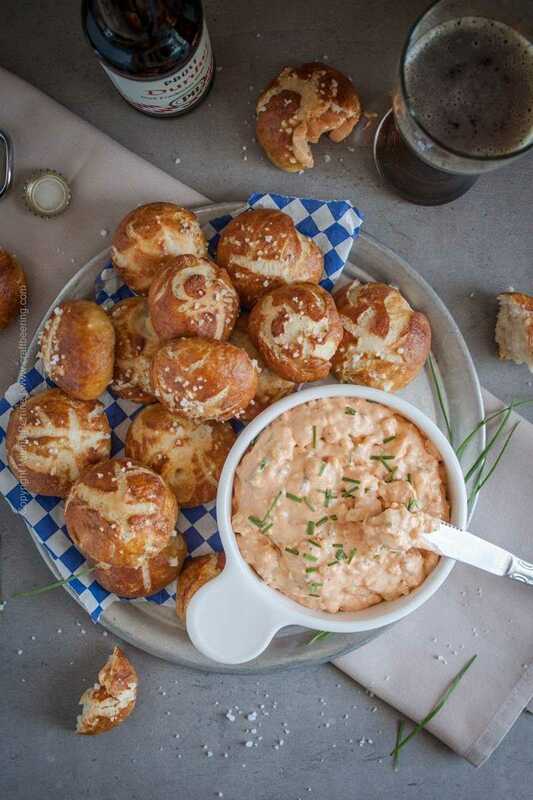 Sometimes the dip is shaped like a ball, onto a plate and presented with a few hard pretzels sticking from the top and a bunch surrounding it. Frequently rye bread or fresh bread such as baguette is served along. Sometimes an Obatzda platter is arranged with the spread in the middle, surrounded by olives, veggies and slices of bread. Sweet onions, sliced in thin rings and thinly sliced radishes (or spiralized white winter radish) are often used as garnish. Sometimes to keep things simple a good sprinkle of chives is all you need. By now you should be well equipped with knowledge to prepare the perfect Obatzda dip. WHAT FLAVOR LAUGHING COW DO@YOU USE? THE CREAMY SWISS OR THE CREAM CHEEESE ONE? Either one will be fine. I’d say go with the one you prefer. The flavor of the spreadable cheese is overpowered by the Camembert and its role is mostly to bind all the ingredients together and create a spreadable dip. Delicious! Thanks for sharing at the What’s for Dinner party. Can’t wait to see what you’ll bring next week! Have fantastic day! how much salt and pepper does the recipe call for? I don’t see it listed in ingredients. Thank you for asking and noticing I’d missed it in the recipe card. Add salt and pepper to taste, maybe start with a pinch of each, then taste and adjust. I can eat the Obatzda by spoonfuls! though I would grab those cute pretzel buns? in a heart beat too! What a fabulous combination of flavours Chris and Milena. One to try for sure! Thank you for linking up at Create, Bake, Grow & Gather this week. I’m delighted to be featuring your Cheese Dip at tomorrow’s party and pinning too. Thank you so much, Kerryanne! This will be a delicious Cheese Dip! Hope you are having a great week and thanks so much for sharing your awesome post with us at Full Plate Thursday! Now that’s an inviting platter! My hubby will love this!! Looks delicious and easy! This would be great to take to a pot luck! Thanks for sharing at The Blogger’s Pit Stop! Definitely a good choice for potlucks! Thank you Roseann for stopping by. OK – Pinning. I love the idea of the camebert in the dip – it looks and sounds fantastic! Thanks for sharing at the What’s for Dinner party – have a great week! 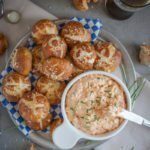 Yes, I could definitely sit down to this just about any day of the week 🙂 Love the cheese dip and those lovely little pretzel buns to dip in it! So where has this been my whole life, huh?? Seriously, though, looks AMAZING…though, you knew I would say that 😉 Loves me some cheese!! This would be dangerous around me cause I’d want to eat the entire dish of it myself!! Helllllooooo treadmill! Although I’m not a beer guy, I’m petty much a Camembert and cheese dips lover! Cannot imagine how beer works in a dip, but I’d certainly give a try to this rich and velvety dish! You do need to try it out! Thank you, Ben!